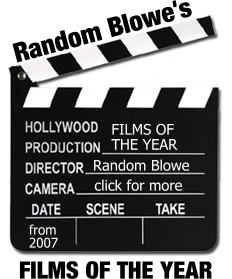 Random Blowe: BP - Too Important To Capitalism To Fail? BP - Too Important To Capitalism To Fail? Six weeks have passed since the explosion on the Deepwater Horizon offshore drilling platform that has resulted in the worst environmental disaster in US history and yet everything BP has attempted in order to halt the flow of oil into the Gulf of Mexico has failed. The situation is growing so desperate that the house magazine of America’s conservative right, the National Review, is even advocating the nuclear option. But back in the UK, all the talk has been about the impact of the disaster on the British economy, as the company faced the biggest one-day fall in its share price for 18 years, wiping £12bn off its stock market value. Another £2.4bn was lost when trading began today. It’s a reminder of just how much of an impact a relatively small number of multinational companies have on the fragile system of international capitalism and how, just like the banking crisis in 2008, a disaster in one part of the world has global effects. We heard again and again, after the collapse of banks exposed to the US sub-prime market, that some banks were just ‘too big to fail’, even if this encouraged high levels of risk in the pursuit of high rewards. Others have argued that the UK’s arms industry, despite its evident corruption, is also too important to lose. Whilst a global company like BP is unlikely to ever be forced in bankruptcy, it does face enormous clean-up and containment costs, the prospect of punitive fines and compensation payments to the Louisiana fishing and tourism industries. In the long term, it may decide to use the tactics that Exxon adopted after the Exxon Valdez disaster in 1989 to minimise these costs. But in the short-term, a jittery market threatens its ability to pay what had historically been high dividends to its shareholders and because BP accounts for a disproportionately large share of the income received by pension scheme investors, around 8% of all income, private pensions in Britain will suffer. Today, two Democrat senators, Chuck Schumer of New York and Ron Wyden of Oregon, wrote to BP CEO Tony Hayward, calling on him to suspend planned dividend payments to shareholders until the full costs of the oil spill can be calculated. "The US is a big and important market for BP, and BP is also a big and important company for the US, with its contribution to drilling and oil and gas production. So the position goes both ways"
Although nominally a British company, the likelihood that the public would easily stomach another UK corporate welfare cheque, this time in the form of state assistance to BP, is almost zero at a time when the Con-Dem government is ushering in a new era of austerity. But a bailout is exactly what the company may get in the US: Republican senator Lisa Murkowski, from Sarah Palin’s home state of Alaska, has blocked efforts to raise the cap on liabilities that BP faces. Under current laws BP is only liable to pay for the first five days of clean-up (approximately $75 million), leaving the government covering the rest (over $560 million and counting). Presumably Murkowski is so keen to defend the interests of accident-prone Big Oil that she is unfazed by last week’s shut-down of the Trans-Alaska Pipeline, partly owned by BP and on her own doorstep, after it spilled several thousand barrels of crude oil into backup containers. 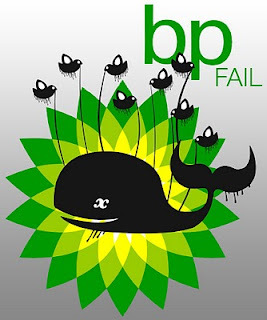 See Greenpeace's Tar Sands Campaign for more designs to rebrand BP with a new logo that is more suitable for their dirty business.